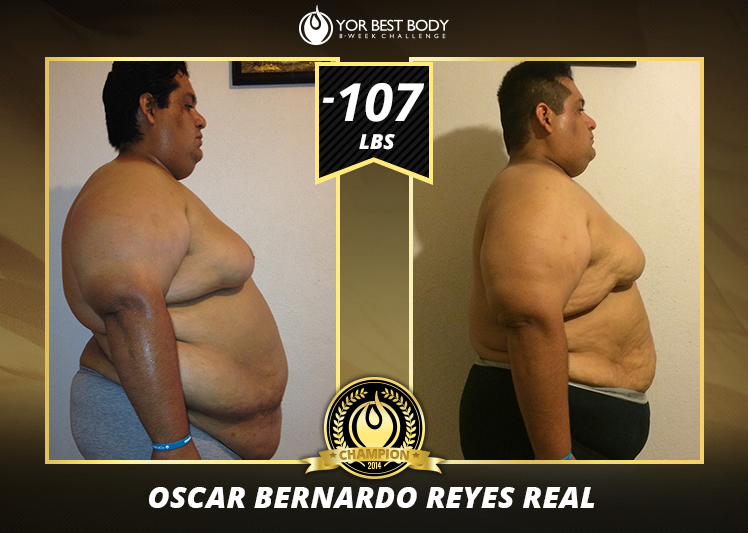 My weight when I started the YOR Best Body Challenge in October 2013 was 190.9 kg / 420.86 lbs. Today, thanks to the Challenge I weigh 142.3 kg / 313.72 lbs. When I started the Challenge I consumed the Slim Set, which included YOR Shake®, YOR Probiotics Ultra, YOR Digest Ultra and YOR Berry Blast. However, after finishing the first cycle of the Challenge and winning first place in my group, I was able to enjoy the whole line of products, the YOR Essential Vitamins, the YOR Super Greens, the YOR Fiber Plus and the YOR Repair, the full charge to get deeper and deeper in a new life, to recover my life. Let me tell you that I consumed the products on a daily basis, even in my days off, the YOR Digest was always present. They were all present all the time, in the morning upon rising, at midday and at the end of the day, the YOR Health products are now my loyal companions. I exercised after my second cycle of the Challenge, once I had got rid of over 36 kg / 79.37 lbs of weight and I felt I could practice sports again. I was afraid, I won’t deny it, I thought, I’ll get injured, I’ll have some physical alteration, I won’t endure the routines, but my biggest surprise was that I did it, I was able to do it and it was wonderful. 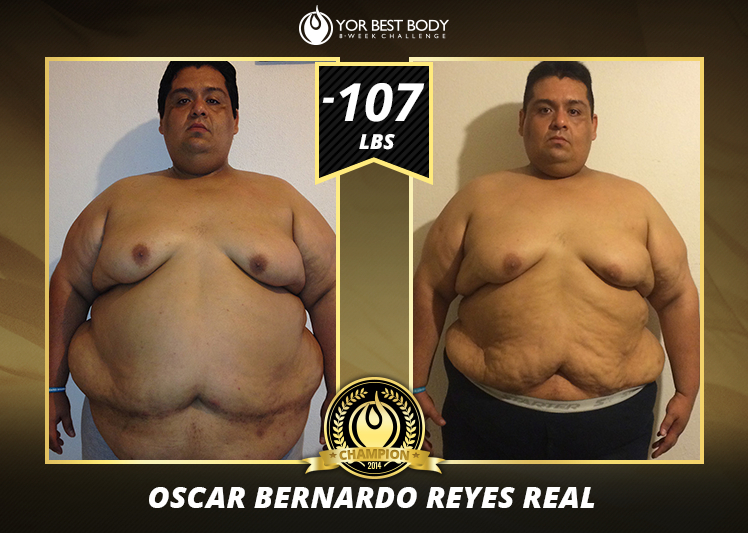 The impact YOR Health has had in my life is huge. I was feeling desperate, I used to cry, I was looking for the quick fix, I had hope but it was gone, and I was afraid, very afraid of losing the most precious thing I have: MY LIFE. However, my partner was there to support me, I won’t lie, I even thought that because of my excessive weight I was going to lose her, my wife, the one who has always been there by my side. I even considered the gastric bypass, however, one night, out of nowhere, the people who weren’t tired of promoting this new lifestyle were there again. How? Via Facebook with the now famous YOR HEALTH video about the CHALLENGE. I turn to my wife and told her, “What can I lose? My money? And if lose weight? I’ve gained it all.” Determined I said yes, I take the Challenge, and that’s how my adventure began. I was able to see how my body transformed day by day, how I stopped wearing some clothes because they were big on me, how I returned to activities like WALKING. Yes, as simple as that, walking was very difficult to me already, I was feeling swollen, my feet, my back and my neck hurt, there were spots on my face, etc. This are the consequences of an intoxicated body. During this time, DECEMBER came in, and in Mexico it means parties and excessive drinking and eating, anyway, it means to celebrate by torturing the body. I came to think, will I make it?? However, it was easier than I thought. In spite of some excesses I came out victorious, and it was all thanks to the products, and if I wasn’t such an analytic person I would say that it was magic, but no, it wasn’t magic, it was just the high quality of the products. Today, after a third cycle of the Challenge, and on the verge of starting a fourth stage of this adventure, my spirit is high to recover the waist size below 50 in pants, and below XL in shirts, so that I can say I can wear now sizes available in stores. This motivates me, looking like a normal person. I have nothing left to say but God bless whoever formulated this products because they are very noble and they really make a positive impact in people’s lives.